An aerial view of the Los Angeles Stadium being built in Inglewood. Photo by Phillip Kalantzis Cope. The Los Angeles Rams. The San Francisco 49ers. The Sacramento Kings. The Golden State Warriors. The Los Angeles Clippers. The Oakland As. And, possibly, the Los Angeles Angels of Long Beach? These are all sports teams that have recently built, are in the process of building or are hoping to build a new stadium for their teams. Some of them are staggeringly expensive—the 49ers stadium in San Jose, a public-private partnership approved by its taxpayers, cost $1.31 billion and was opened in 2014—and communities often feel the effect of the stadium even before it’s fully constructed. Inglewood, soon to be home to the $4.9 billion Los Angeles Stadium for the L.A. Rams and L.A. Chargers, had to enact an emergency rent control ordinance because of skyrocketing rent increases placed on businesses and homes around it. That latter point on gentrification is important. Take, for example, the story of Beverly Brinson, one of many in Inglewood feeling the detrimental effects of a stadium coming into town: Owner of the popular Ms. B’s M & M Soul Food that has been serving the neighborhood since the 1990s, she saw her rent more than double from $6,282 to $14,000—and it is forcing her to move away from the place she has called home since 1974. On the flip side, other restaurant owners are trying to get in on the change. Derrick Brown of Bourbon Street Fish and Grill, is hoping that the new stadium will be a goldmine for business, especially since he lost a steady stream of customers when Hollywood Park closed up shop. The obvious question of gentrification and its attachment to sporting arenas is a tricky one: Inglewood, by and large, has been disinvested for decades—the Lakers, the Kings hockey, and the LA Sparks all left the Forum between 1999 and 2001 to head over to the Staples Center while Hollywood Park closed in 2012—making the possibility of gentrification a more tangible reality with a shiny new stadium coming in. Actually, make that two shiny stadiums: the state Senate passed a bill in September that fast-tracked a new arena for the Clippers in Inglewood, a bill very similar to the one that will fast-track the stadium for the Oakland As. And the argument from politicians as to why these projects are favored is that they are “economic stimulators”—despite evidence that there is no significant economic growth to a city when adding a new sports team or stadium. When politicians speak of fast-tracking massive development projects, they are largely referring to bypassing the requirements set forth by the California Environmental Quality Act—CEQA, pronounced “seek-wuh”—in which a public entity, before approving any significant development project, is required to deeply examine the environmental consequences of the project. This is done by way of an Environmental Impact Report, or EIR, a lengthy, costly document that goes into detail about every aspect of the development project being proposed—and could push projects back by months or years or, at the worst, kill the project entirely. In other words, any form of a CEQA exemption is development gold. 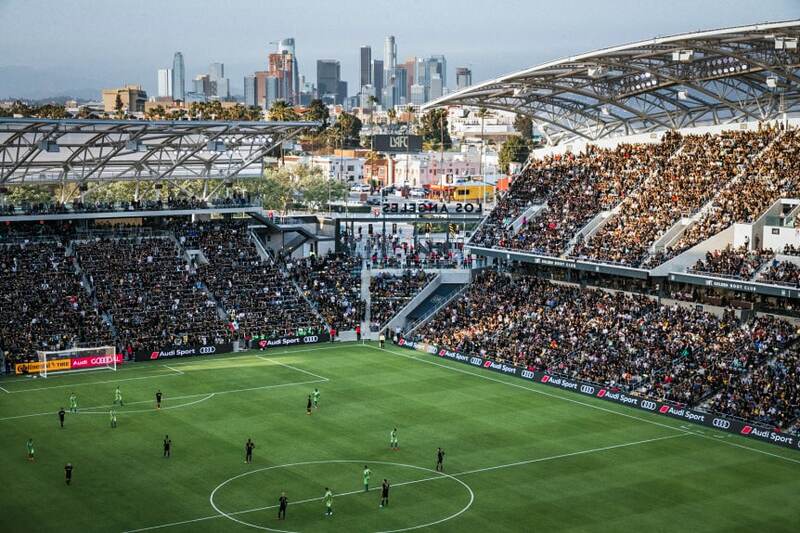 The Banc of California Stadium is now home to the Los Angeles Football Club. Courtesy of the LAFC. With Long Beach, the proposal to build a stadium for the Angels on the waterfront beside luxury towers gives way to a whole different slew of questions, both about gentrification and fast-tracking. Alamitos Beach and Downtown, the two neighborhoods to be most affected by the stadium, are well past the point of pre-gentrification and are two of the more affluent neighborhoods in the city—but they are also home to many people experiencing homelessness and that could become an issue for the owners of what a group of Long Beach business leaders wrote, in an open letter, would “immediately become the most beautiful ballpark in Major League Baseball. The owners of Levi’s Stadium, for example, urged city officials to handle the issue by forcing those experiencing homelessness into an area that was two miles away from the stadium—and city officials did. Even more, the most perturbing aspect is that fast-tracking has been largely given to the wealthy and powerful. “Tons of stadiums have been fast-tracked,” said Anthony Cannella, the former Republican senator from Modesto who spent his last day on the floor last year discussing the inequities with which California streamlines projects. The list of sports arenas that have received benefits is alarming: the Farmer’s Field in Downtown L.A. that never materialized; the Golden1 Center for the Kings basketball team in Sacramento; a Chargers and Raiders football stadium in Carson that never materialized; a new Warriors arena under construction in San Francisco; the new Chargers and Rams Hollywood Park stadium under construction in Inglewood and most recently, the Clippers and A’s stadiums in Inglewood and Oakland. Cannella noted, for example, that the transportation improvements set forth by the massive SB 1 package still have to go through the full, expensive, lengthy, and embattling CEQA process, as does all our housing projects—but not stadiums or powerful companies. While many bills shorten the length of which CEQA lawsuits can be pushed against developments, some of the extent of the bills’ benefits toward stadium developers and sports teams are alarming in their lack of regulation: In 2009, developer Ed Roski was granted full immunity from environmental law for his proposed stadium in the City of Industry; he was unable to attract a team and therefore, the project never became a reality. In other words, the sponsors of the project in Inglewood gathered signatures to put the stadium on a ballot for a special election. But instead of placing it on the ballot, the City Council of Inglewood unilaterally approved the measure, per law, therefore bypassing CEQA, negating the need for an EIR, and completely avoiding litigation. What these histories tell us is that the feasibility of a stadium in Long Beach isn’t highly questionable but, rather, very much a reasonable proposal that could not only become a tangible reality but streamlined in the process. If the Angels do wish to make a home here, they could easily skirt around years of back-and-forth by appealing to the legislature or going to a voter initiative.